Havana, Cuba, a city stuck in a time warp. This old world charm is what attracts visitors to this area as you’ll find vintage American cars from the 1950’s chugging along on Havana’s streets and old buildings on every corner. Havana is a bright and colourful city where you can experience art, culture, learn about Cuba’s history, enjoy listening to musicians playing on the streets, smell the smoke of Cuban cigars and sip cocktails to your hearts content. Come and explore this truly fascinating city before modernity eventually takes over. Havana is an ever changing city and is in the process of a tourism boom. With the rise of travellers coming through from the US, you’ll want to catch this city before it gives way to development of more resorts, hotels and an influx of tourists who will change the true essence of this interesting city. 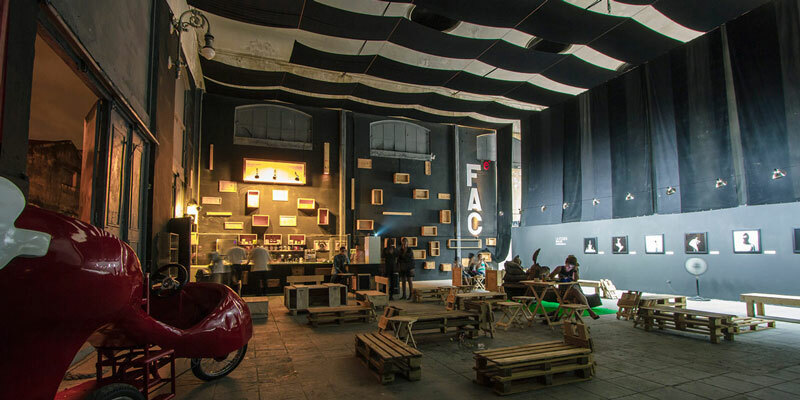 Housed in an old converted factory, Fabrica de Arte Cubano is a must visit place for lovers of the arts. It is lively hub of activity from live bands, art installations, theatre and indoor and outdoor spaces where you can eat and drink at the bars. Fabrica de Arte is truly a special place, it’s modern, it’s chic and it’s a perfect place to experience the art scene in Havana. It’s a perfect place for both locals and visitors alike. Make sure you arrive here early to avoid disappointment and be mesmerised by the spirit of Cuba.